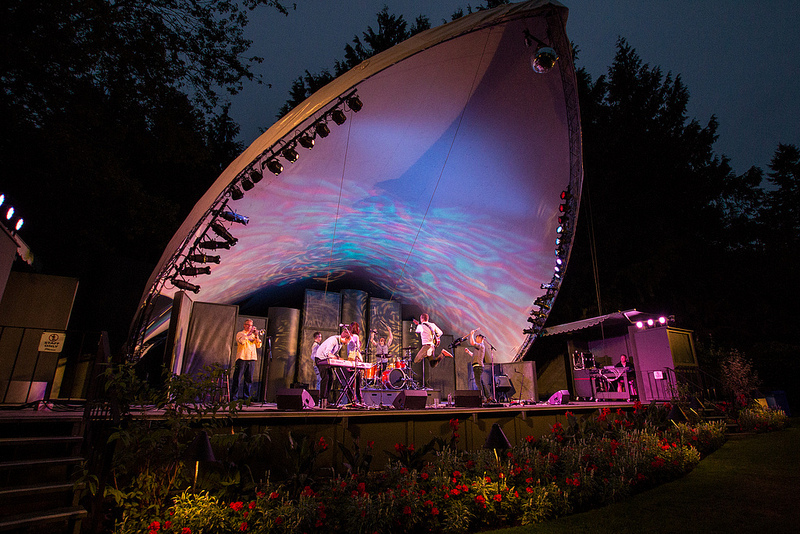 Last night we headed to the world famous Butchart Gardens to catch 2013 Peak Performance Project artists, Towers and Trees. I've only ever been to Butchart Gardens at night time, and usually it's raining. It seems every other year or so I end up there for their Christmas displays which is an okay way to get into the spirit of a holiday I'm not a huge fan of. I think I went there once for the fireworks with some friends, but we got there just before the fireworks kicked off. We arrived maybe a half hour before the show started just to kind of wander around before the concert. Butchart Gardens is a beautiful place. I'd like to go back sometime soon before all the flowers are gone to take some more photos. Even if it means braving herds of tourists and the insane admission price to see flowers. When we made our way to the area the band was playing I was amazed to find we got front row seats. A little too close to Jesse's crazed screaming fans (his mom and sisters) if you ask me. It was a very intimate concert it felt like we were witnessing something special. I was honestly too busy enjoying the concert to take too many photos. Plus the fact that I didn't want to run around in front of all those people taking photos. Their set peppered with wonderful covers of Aidan Knight, Current Swell, Van Morrison, Edward Sharpe, and K-OS. The later proving that yes, Adrian can rap. Well, sort of. A standout for me was the third song of the set, "We're Not Islands." The band started with this preamble that was incredibly reminiscent of Broken Social Scene performances I've seen in the past. At one point during the song the band dipped into a brief cover of Hey Rosetta's "Red Heart." All in all it was an amazing thing to see. I wish Adam Lee was there to capture it. With performances like this it is certain there are big things ahead for Towers and Trees. It's no wonder they made the top 20 for Peak Performance, and honestly the smart money is on them for winning the whole thing this year. There are a few more photos on my flickr.